Who is to Blame, Laptop Battery or Indicating Software? 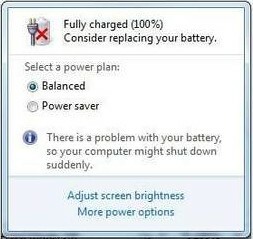 Since the appearance of Windows 7 problem, we have to think more about the battery software in the laptop. Especially when there’s something wrong with laptop standby time, we no longer blame the laptop battery merely but beginning to obverse any other factors. In the past, when laptop occurs to be power off in a very short work time, the first that comes into mind is laptop battery. Indeed, laptop battery capacity will be reduced as long as the performance is not so good. And thus condition is most likely to make us confused: although it is indicated to be full or more than half, it may also be shut down in one minute. Consider the principle of battery protection circuit and you’ll find out. Under this circumstance, many users will go for a replacement laptop battery to get rid of any serious accidents happen. In theory, when protection circuit works, it means that the battery cannot provide enough power and overheat probably. Consequently, it is important to check if there’s any problem with laptop battery or battery management software. Otherwise, any other replacement laptop batteries cannot get it back to normal. Normally, when the battery is on the edge of endurance, it could be hotter while the system comes to be slower. And if the software is an external one, you can reinstall it and check if it has recovered.